Eight respected PhDs expose the truth about radiometric dating and years of science fiction! 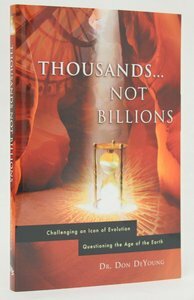 - Publisher This book shatters the famed dating methods employed by evolutionists to cast doubt on the veracity of the Bible and its chronology of earth history. Radiometric dating is one of the linchpins of evolutionary education today. By dating the soil in which fossils are found to very long ages, evolutionists undermine faith in Genesis as the true documentary of the history of the universe. When people are told that a dinosaur bone has been determined to be tens of millions of years old, that obviously doesn't square with the biblical record of man being created on day 6 with the land animals. But DeYoung now demonstrates that Christians no longer have to puzzle over this glaring contradiction. A must-have for the serious Bible student, Thousands... not Billions will bolster the faith of many. This book shatters the famed dating methods employed by evolutionists to cast doubt on the veracity of the Bible and its chronology of earth history. Radiometric dating is one of the linchpins of evolutionary education today. By dating the soil in which fossils are found to very long ages, evolutionists undermine faith in Genesis as the true documentary of the history of the universe. When people are told that a dinosaur bone has been determined to be tens of millions of years old, that obviously doesn't square with the biblical record of man being created on day 6 with the land animals. But DeYoung now demonstrates that Christians no longer have to puzzle over this glaring contradiction. A must-have for the serious Bible student, Thousands... not Billions will bolster the faith of many.